Larger than most markets you've probably ever been to, the Ferry Building Marketplace is an expansive, beautiful, and historical place to try a variety of food and drink as well as local shops every few steps. You can easily spend an hour or two sampling and shopping and stepping outside to enjoy the view of the San Francisco Oakland Bay Bridge. There is a lot of art to see in the city, but off the high-trafficked trail is some art that will help you burn some calories off while you enjoy it. 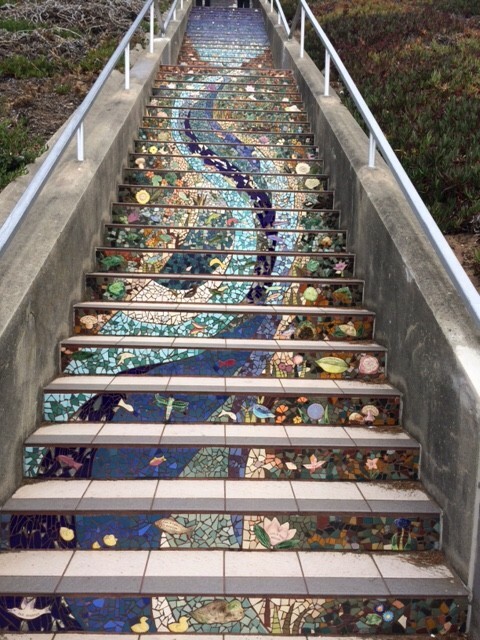 The beautifully tiled stairways surround Grand View Park. We didn't find the tiled steps right away and ended up climbing all the way to the top of the park in search of them, which ended up being worth it, since the name of the park lives up to it's name. Once we were done taking in the view and catching our breath, we wandered around until we finally found these beautiful steps and enjoyed the much easier walk down. Tip: We took an Uber to and from this area since there wasn't much else around within a short walking distance around it. With so many neighbors to check out you really have to do your research ahead of time so you know where your time and money is best spent. We spent an afternoon in the eclectic and grungy neighborhood called The Mission. It's for art lovers, food lovers, and people that aren't afraid of walking the less glamorous and tourist-luring streets. Valenica Street and the surrounding blocks will keep you busy with great food and coffee, book stores, vintage shops, and street art. 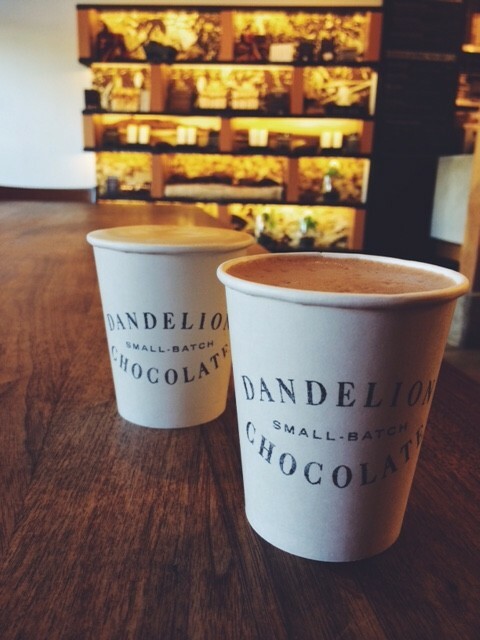 Our first stop was Dandelion Chocolate, a small batch chocolatier, which had quite possibly the best hot chocolate I have ever consumed. The coffee bean normally gets all the love, but this bean-to-bar shop is a great place to indulge yourself while on vacation and even bring back a gift for your chocolate loving friends back home. In decades past, a large Mexican immigrant population moved into this area, and that can be felt even to this day in the culture as well as the food. There were a lot of options to get some authentic mexican food in the Mission, but we stopped at Tacolicious, which was across the street from Dandelion. This food was seriously good and seeing how packed it was on a weekday I could tell this was a popular neighborhood spot. I'm sure there could be better spots in the Mission for mexican food, but I was quite content that we stopped here and would go again. If you are a street art lover a stroll down Clarion Alley while you are in the Mission is a must see. This alley is located between Mission and Valencia Streets and 17th and 18th Streets. A lot of the art has meaning behind it with some political and humanitarian messages. You may even see an artist working while you stroll. San Francisco is a city of beautiful parks, and if you are traveling on a budget, sightseeing in these free parks can be a great way to see the city not to mention some magnificent views. This area offers some scenic spots to snag your own photo of what is some, say, the most photographed bridge in the whole world, and once you see it in person you can understand why. You just can't stop looking at it. It's easy (and free) to explore with a hiking trail to follow down to the waterfront and get in shots of every angle of this beaut. You can also hike back up and take a walk in the bridge itself. Not too far from the Haight Ashbury area or the larger Golden Gate Park is a very steep and beautiful park known mostly for being the perfect spot to grab a Full House selfie with the Painted Ladies. Another park with a great view, if you have some great weather like I did, this is an ideal place to sit a spell and relax. You may not want to pick a patch of grass in front of the ladies unless you love watching people take 100 images of themselves while singing the Full House theme (I'm a guilty party). No this park is not actually near the Golden Gate Bridge, but hosts a myriad of gardens to enjoy not to mention some of the best museums in the city. At three miles long you might not make it all the way through but as long as you make it at least to the Academy of Sciences you are doing good. We toured the Japanese Tea Garden which while within the free park is not free itself. Price of admission is $8 per person for non-residents. While that cost might not break the bank, I did feel like it wasn't worth it since the gardens themselves are small. If you are a museum lover and science nerd make sure that you set aside a few hours to explore the Academy of Sciences within Golden Gate Park. Admission is $34.95 per person but well worth it since hours can be spent here touring the exhibits not to mention the four story Osher rainforest brimming with all types of tropical life. This was a highlight of my trip and should not be missed. One of the most iconic parts of San Francisco apart from the Golden Gate bridge might be Fisherman's Warf. In my opinion this whole area is a tourist trap with nothing worth spending your time on. There is an aquarium and boat tours and sure seeing the seals sunbathing is cute for about five minutes, but other than that it's cheap shopping and chain restaurants. Skip time spent there for a more authentic neighborhood or experience. Despite the fact that San Francisco's Chinatown is the largest (outside of Asia) and oldest in North America, I just can't help but feel that if you've seen one Chinatown, you've seen them all. Since I've visited Chinatown's in Philly, New York, and Boston, this one seemed no different and I spent very little time there. 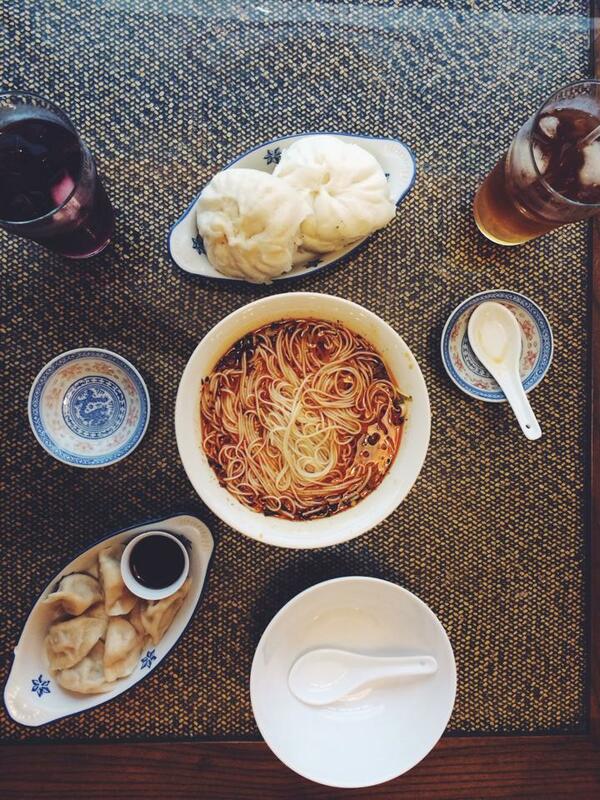 Replace time spent in Chinatown and visit Japantown. Smaller and cleaner there is an awesome shopping area called Japan Center where authentic food and shopping awaits. At the end of the day I could take or leave a stroll through Haight-Asbury. There were a few good shops and a lot of restaurants, and a few worthwhile vintage boutiques, but only one that I could afford anything in. There were a few decent street art sightings. Just when I was about to cross this area off the must see list, I came to the mecca that Amoeba Music. The word extensive doesn't seem to do the selection justice. When you walk in you just stand there for a moment not knowing what section to tackle first. Depending on your music freak level, you may want to set aside a decent chunk of time to go through the numerous stacks of wax. A visit to Sonoma or Napa might be on your agenda, and although we visited a few wineries I really couldn't pretend to be an expert on where to go, other than to tell you that many of them have free tastings so do your research ahead of time. What I can tell you about is a whimsical hidden gem we found in Sonoma at the Train Town Railroad. What appears to be a very small amusement park for kids ended up being a great pit stop for a few cheap rides. In between enjoying the perks of being an adult in Sonoma, there was a lot of joy in being a kid again. People will tell you San Francisco is a very walk able city which is true to a certain degree, but if you are neighborhood hopping you will not be able to walk everywhere, and if you tried your calves would surely be burning and aching rendering themselves useless from the extreme hills. Uber is a great tool to get around the areas you can't walk to. The cable cars only go to certain areas, and you can end up waiting in long lines to hop on at busier stops. Depending on the sites you plan on seeing and how long you will be in the city you may want to invest in a City Pass. This give you admission to certain attractions not to mention unlimited cable car rides which otherwise are $5 for each hop on cash only. Getting from the airport to the city is easy with the B.A.R.T or Bay Area Transit System. No cabs needed.